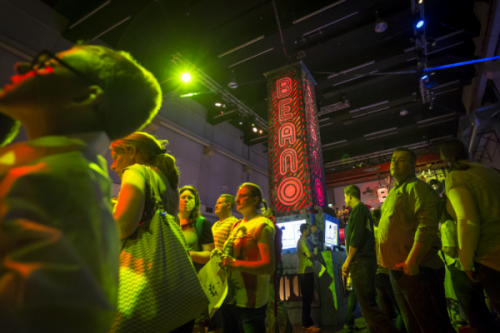 Event productions company Strong & Co asked us to build the lighting tower centerpiece to their enormous experiential event for the launch of the Beano's online magazine. 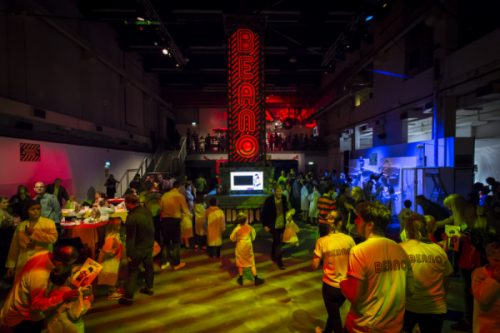 We created a 6m high Beano tower with internal lighting, 4 video content screens around the outside and various dials, gadgets and gauges to tie in with their theme of a huge power station of fun. The tower was made from a massive 1m diameter, 5m tall acrylic cylinder, in which we hung a series of DMX controlled LED lighting, so that the lighting tower could pulse colours up and down, and even spin all the ay round. Around the lighting tower was another layer of CNC cut decor featuring the newly revamped Beano logo. The rigging and support was further hidden with another set of stage flats, with a set painting job to give an exaggerated, comical look. We sent four of our ultra narrow bevel LED TVs into the frame, which were used to display video content throughout the experience. We are obsessed with details, so to finish off the lighting tower, which according to the narrative of the event was a power generator or sorts, we strung four tension wires to other areas of the building and decorated them with arcline strobe tubes, to give an electric effect running down the cables to other areas of the set. The story and experience for the kits culminated in "filling" our lighting tower with fun, which then sent power to the other areas. As you can see for the photos, the event was full of energy, colour, mayhem and above all, fun.